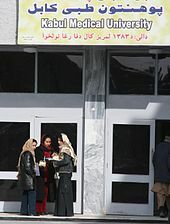 For other places with the same name, see Kabul (disambiguation). GSM/GPRS mobile phone services in the city are provided by Afghan Wireless, Etisalat, Roshan, MTN and Salaam. As of 2012[update], all of them provide 3G services as well. 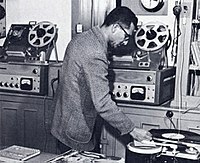 In November 2006, the Afghan Ministry of Communications signed a $64.5 million US dollar deal with ZTE on the establishment of a countrywide fibre optical cable network to help improve telephone, internet, television and radio broadcast services not just in Kabul but throughout the country. Internet cafes were introduced in 2002 and has been expanding throughout the country. As of 2012[update], 3G services are also available. 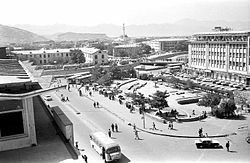 Wikimedia Commons has media related to Kabul. 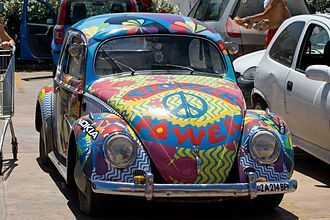 Wikivoyage has a travel guide for Kabul. 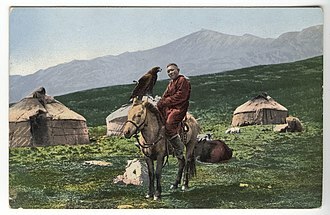 The dynasty, though ethnically Turco-Mongol, was Persianate in terms of culture. The Mughal empire extended over parts of the Indian subcontinent. The beginning of the empire is conventionally dated to the victory by its founder Babur over Ibrahim Lodi, the Mughal emperors were Central Asian Turco-Mongols belonging to the Timurid dynasty, who claimed direct descent from both Genghis Khan and Timur. 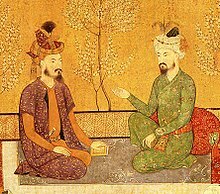 During the reign of Humayun, the successor of Babur, the empire was briefly interrupted by the Sur Empire, the classic period of the Mughal Empire started in 1556 with the ascension of Akbar the Great to the throne. Under the rule of Akbar and his son Jahangir, the region enjoyed economic progress as well as harmony. Akbar was a warrior who forged alliances with several Hindu Rajput kingdoms. Some Rajput kingdoms continued to pose a significant threat to the Mughal dominance of northwestern India, the reign of Shah Jahan, the fifth emperor, between 1628 and 1658 was the golden age of Mughal architecture. 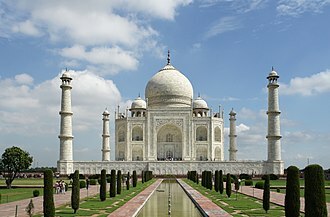 He erected several monuments, the best known of which is the Taj Mahal at Agra, as well as the Moti Masjid, the Red Fort, the Jama Masjid, Delhi. By the mid-18th century, the Marathas had routed Mughal armies, during the following century Mughal power had become severely limited, and the last emperor, Bahadur Shah II, had authority over only the city of Shahjahanabad. He issued a firman supporting the Indian Rebellion of 1857 and following the defeat was therefore tried by the British East India Company for treason and exiled to Rangoon. Contemporaries referred to the empire founded by Babur as the Timurid empire, which reflected the heritage of his dynasty, another name was Hindustan, which was documented in the Ain-i-Akbari, and which has been described as the closest to an official name for the empire. 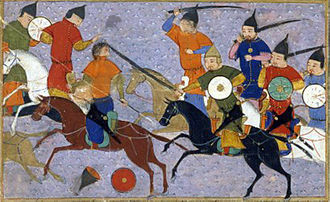 In the west, the term Mughal was used for the emperor, and by extension, the use of Mughal derived from the Arabic and Persian corruption of Mongol, and it emphasised the Mongol origins of the Timurid dynasty. 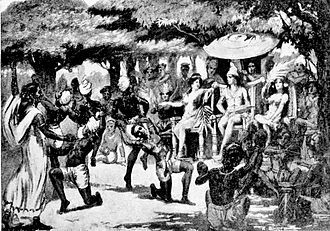 The term gained currency during the 19th century, but remains disputed by Indologists, similar terms had been used to refer to the empire, including Mogul and Moghul. 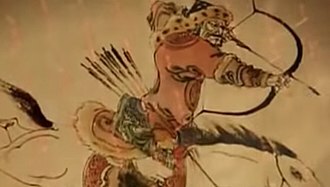 Nevertheless, Baburs ancestors were sharply distinguished from the classical Mongols insofar as they were oriented towards Persian rather than Turco-Mongol culture, ousted from his ancestral domains in Central Asia, Babur turned to India to satisfy his ambitions. He established himself in Kabul and pushed steadily southward into India from Afghanistan through the Khyber Pass, Baburs forces occupied much of northern India after his victory at Panipat in 1526. The preoccupation with wars and military campaigns, did not allow the new emperor to consolidate the gains he had made in India, the instability of the empire became evident under his son, who was driven out of India and into Persia by rebels. Humayuns exile in Persia established diplomatic ties between the Safavid and Mughal Courts, and led to increasing Persian cultural influence in the Mughal Empire, the restoration of Mughal rule began after Humayuns triumphant return from Persia in 1555, but he died from a fatal accident shortly afterwards. The Samanid Empire, known as the Samanid dynasty, Samanid Emirate, or simply Samanids, was a Sunni Iranian empire, ruling from 819 to 999. The Samanid state was founded by four brothers, Ahmad, Yahya, in 892, Ismail ibn Ahmad united the Samanid state under one ruler, thus effectively putting an end to the feudal system used by the Samanids. 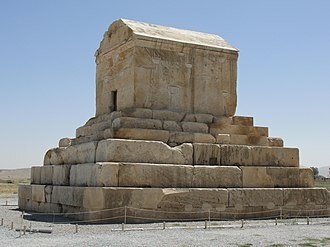 It was under him that the Samanids became independent of Abbasid authority, the Samanid Empire is part of the Iranian Intermezzo, which saw the creation of a Persianate culture and identity that brought Iranian speech and traditions into the fold of the Islamic world. This would lead to the formation of the Turko-Persian culture, the Samanids promoted the arts, giving rise to the advancement of science and literature, and thus attracted scholars such as Rudaki and Avicenna. While under Samanid control, Bukhara was a rival to Baghdad in its glory, scholars note that the Samanids revived Persian more than the Buyids and the Saffarids, while continuing to patronize Arabic to a smaller degree. In a famous edict, Samanid authorities declared that here, in region, the language is Persian. 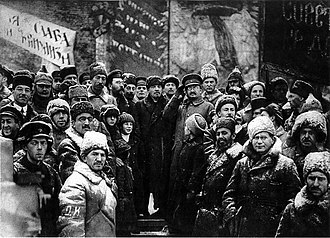 The eponymous ancestor of the Samanid dynasty was Saman Khuda, a Persian noble who belonged to a dehqan family, the latter is more probable since the earliest appearance of the Samanid family appears to be in Khorasan rather than Transoxiana. 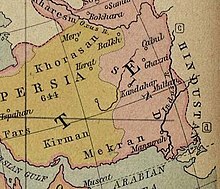 Originally a Zoroastrian, Saman Khuda converted to Islam during the governorship of Asad ibn Abdallah al-Qasri in Khorasan and this marked the beginning of the Samanid dynasty. He was defeated at a battle near Pushang in 857, and fled to Nishapur, the Tahirids thereafter assumed direct control over Herat. 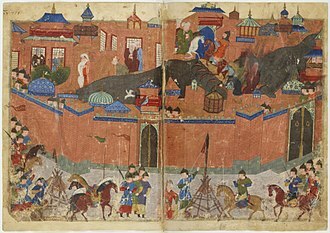 In 839/40, Nuh seized Isfijab from the nomadic pagan Turks living in the steppe and he thereafter had a wall constructed around the city to protect it from their attacks. He died in 841/2—his two brothers Yahya and Ahmad, were appointed as the joint rulers of the city by the Tahirid governor of Khorasan. After Yahyas death in 855, Ahmad took control over Shash and he died in 864/5, his son Nasr I received Farghana and Samarkand, while his other son Yaqub received Shash. It is the main river in eastern Afghanistan and is separated from the watershed of the Helmand by the Unai Pass. 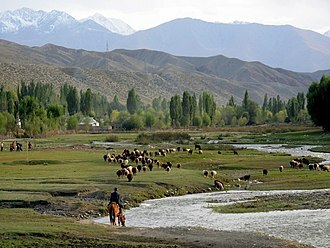 The major tributaries of the Kabul River are the Logar, Kunar, Bara, the Kabul River is little more than a trickle for most of the year, but swells in summer due to melting snows in the Hindu Kush Range. The Kunar meets the Kabul near Jalalabad, in spite of the Kunar carrying more water than the Kabul, the river continues as the Kabul River after this confluence, mainly for the political and historical significance of the name. The Kabul River is impounded by several dams, the Naghlu and Darunta dams are located in Kabul and Nangarhar provinces of Afghanistan. The Warsak Dam is in Pakistan, approximately 20 km northwest of the city of Peshawar, in Arrians The Campaigns of Alexander, the River Kabul is referred to as Κωφήν Kōphēn, the accusative of Κωφής Kōphēs. 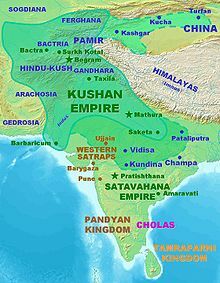 The word Kubhā which is the ancient name of the river is both a Sanskrit and Avestan word, many of the rivers of Pakistan and Afghanistan are mentioned in the Rig Veda. The British Raj was the rule by the British Crown in the Indian subcontinent between 1858 and 1947. The rule is called Crown rule in India, or direct rule in India, the resulting political union was called the Indian Empire and after 1876 issued passports under that name. It lasted until 1947, when the British Indian Empire was partitioned into two sovereign states, the Dominion of India and the Dominion of Pakistan. 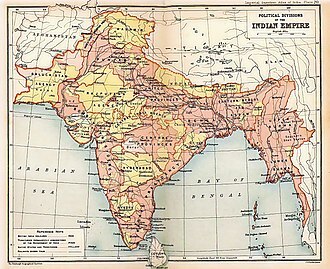 The British Raj extended over almost all present-day India and this area is very diverse, containing the Himalayan mountains, fertile floodplains, the Indo-Gangetic Plain, a long coastline, tropical dry forests, arid uplands, and the Thar desert. In addition, at times, it included Aden, Lower Burma, Upper Burma, British Somaliland. Burma was separated from India and directly administered by the British Crown from 1937 until its independence in 1948, among other countries in the region, Ceylon was ceded to Britain in 1802 under the Treaty of Amiens. Ceylon was part of Madras Presidency between 1793 and 1798, the kingdoms of Nepal and Bhutan, having fought wars with the British, subsequently signed treaties with them and were recognised by the British as independent states. The Kingdom of Sikkim was established as a state after the Anglo-Sikkimese Treaty of 1861, however. 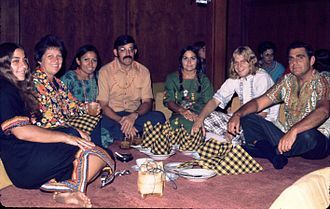 The Maldive Islands were a British protectorate from 1887 to 1965, India during the British Raj was made up of two types of territory, British India and the Native States. In general, the term British India had been used to to the regions under the rule of the British East India Company in India from 1600 to 1858. 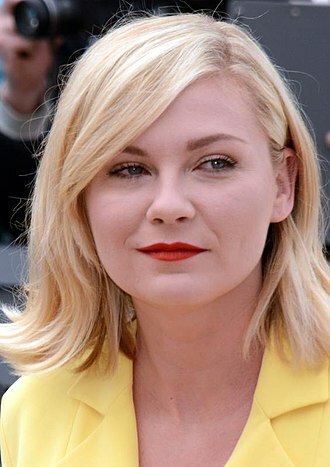 The term has used to refer to the British in India. The terms Indian Empire and Empire of India were not used in legislation, the monarch was known as Empress or Emperor of India and the term was often used in Queen Victorias Queens Speeches and Prorogation Speeches. The passports issued by the British Indian government had the words Indian Empire on the cover, in addition, an order of knighthood, the Most Eminent Order of the Indian Empire, was set up in 1878. At the turn of the 20th century, British India consisted of eight provinces that were administered either by a Governor or a Lieutenant-Governor, during the partition of Bengal the new provinces of Assam and East Bengal were created as a Lieutenant-Governorship. 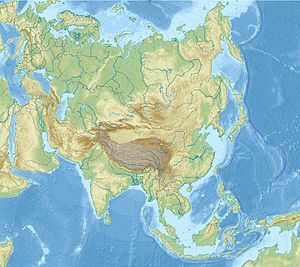 The Greco-Bactrian Kingdom was – along with the Indo-Greek Kingdom – the easternmost part of the Hellenistic world, covering Bactria and Sogdiana in Central Asia from 250 to 125 BC. 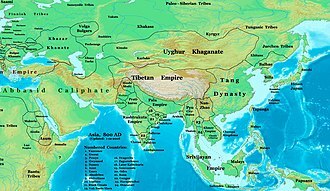 It was centered on the north of present-day Afghanistan, the expansion of the Greco-Bactrians into present-day eastern Afghanistan and Pakistan from 180 BC established the Indo-Greek Kingdom, which was to last until around 10 AD. Diodotus, the satrap of Bactria founded the Greco-Bactrian Kingdom when he seceded from the Seleucid Empire around 250 BC, the preserved ancient sources are somewhat contradictory, and the exact date of Bactrian independence has not been settled. Somewhat simplified, there is a chronology and a low chronology for Diodotos’ secession. The high chronology has the advantage of explaining why the Seleucid king Antiochus II issued very few coins in Bactria, as Diodotos would have become independent there early in Antiochus reign. On the other hand, the low chronology, from the mid-240s BC, has the advantage of connecting the secession of Diodotus I with the Third Syrian War, a catastrophic conflict for the Seleucid Empire. 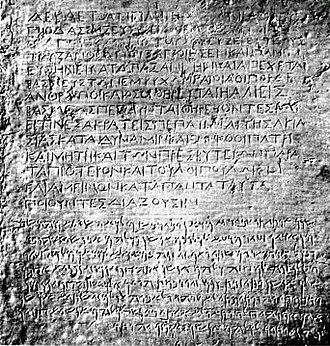 Diodotus, the governor of the cities of Bactria and proclaimed himself king, all the other people of the Orient followed his example. 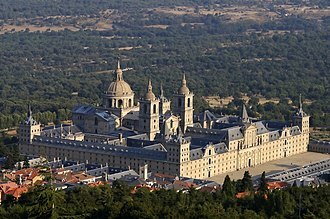 Their cities were Bactra, and Darapsa, and several others, among these was Eucratidia, which was named after its ruler. 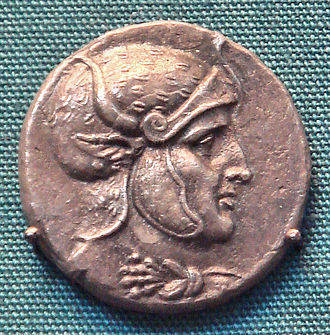 In 247 BC, the Ptolemaic empire captured the Seleucid capital, in the resulting power vacuum, the satrap of Parthia proclaimed independence from the Seleucids, declaring himself king. A decade later, he was defeated and killed by Arsaces of Parthia and this cut Bactria off from contact with the Greek world. Overland trade continued at a rate, while sea trade between Greek Egypt and Bactria developed. Euthydemus, a Magnesian Greek according to Polybius and possibly satrap of Sogdiana, overthrew the dynasty of Diodotus I around 230-220 BC, and the Iaxartes forms the boundary between the Sogdians and the nomads. 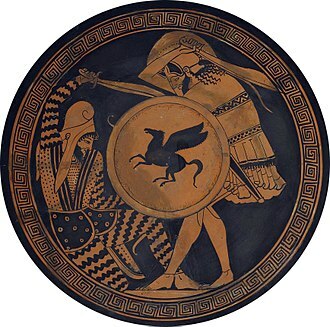 Euthydemus was attacked by the Seleucid ruler Antiochus III around 210 BC, although he commanded 10,000 horsemen, Euthydemus initially lost a battle on the Arius and had to retreat. 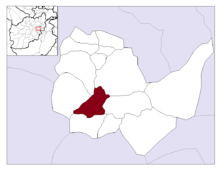 Kābul, situated in the east of the country, is one of the thirty-four provinces of Afghanistan. 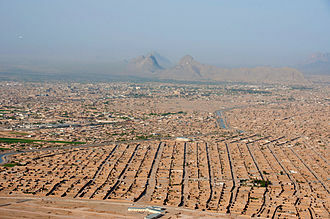 The capital of the province is Kabul city, which is Afghanistans capital, the population of the Kabul Province is nearly 4 million people as of 2012, of which almost 80 percent live in the urban areas. 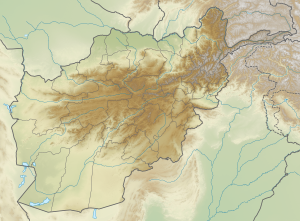 The current governor of the province is Hamid Karzai, Kabul is located between Latitude 34-31 North and Longitude 69-12 East at an altitude of 1800 m above sea level, which makes it one of the worlds highest capital cities. Kabul is strategically situated in a surrounded by high mountains at crossroads of north-south. One million years ago the Kabul region was surrounded from south-east between Lowgar and Paghman Mountains, Charikar in the north and the Ningai Ghar mountains in the west and this region formed an icy sea. Some deep wells in the region of todays Poli Charkhi in the east part of city are the evidence of that time, Kabul is surrounded by Koh-e Paghman Mountain from the east, Koh-e Qrough Mountain from the south-west and Koh-e Shirdarwaza Mountain from the north-east. Kabul has only one river which is called Kabul River, Kabul River rises at the Paghman Mountain toward South Pass about 70 km west of Kabul. It flows in a direction, past Kabul, and through Jalalabad city. The climate within region of Kabul is considered to be arid to semi-arid steppe, because of the very low amounts of precipitation, especially from May to November, Kabul can be very dry and dusty. 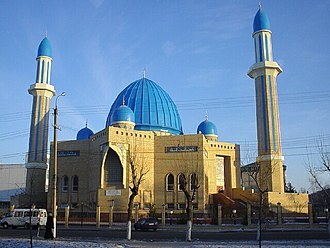 Extreme temperature changes occur from night to day, season to season, the chief characteristic of Afghanistans climate is a blue cloudless sky with over 300 days of sunshine yearly. Even during the winter, skies usually remain clear between snowfalls, which are on average 15–30 cm annually, the daily temperature for Kabul city in winter is −1 °C and in summer 24 °C. 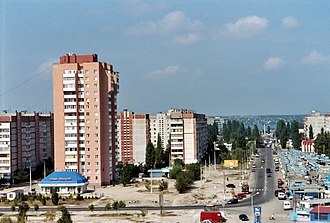 The coldest month of the year is January and the hottest month is July, the maximum temperature has been recorded as +42.7 °C in July and the minimum as -26.3 °C in January. Kabuls history dates back more than 3,500 years and it was once the center of Zoroastrianism and subsequently a home for Buddhists and Hindus. 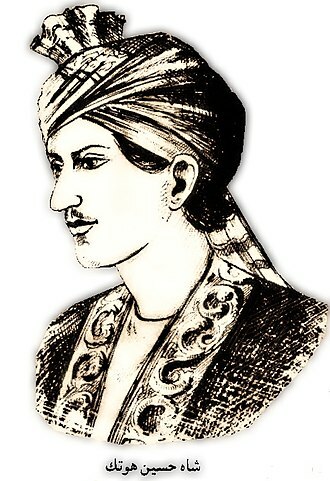 Ahmad Shāh Durrānī, known as Ahmad Khān Abdālī, was the founder of the Durrani Empire and is regarded as the founder of the modern state of Afghanistan. After the death of Nader Shah Afshar in 1747, Ahmad Shah Durrani was chosen as King of Afghanistan. Within a few years, he extended his control from Khorasan in the west to Kashmir and North India in the east, Durranis mausoleum is located at Kandahar, adjacent to the Shrine of the Cloak in the center of the city. 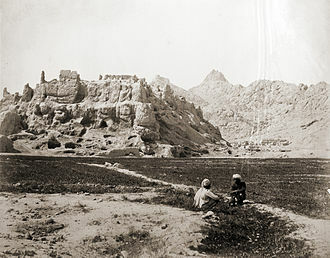 Afghans often refer to him as Ahmad Shāh Bābā, Durrani was born in or about 1722 to Mohammad Zaman Khan, chief of the Abdali tribe and Governor of Herat, and Zarghuna Alakozai. There has been debate about Durranis exact place of birth. Most believe that he was born in Herat, Afghanistan and he was born as Ahmed Khan. Abdalis father suffered Persian captivity for years at Kirman before being released from prison in 1715. As a refugee, he made his way to India and joined his kinsmen at Multan, after he raised his family there, he was recognized as the scion of hereditary Sadozai chiefs. 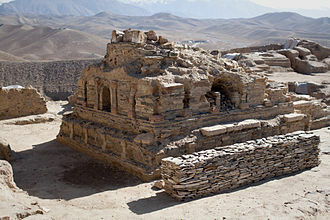 It is believed that Zaman Khan returned to Afghanistan to fight the Persians and his Afghan rivals, so other sources believe that, Abdali was born at Multan in 1722, after which she returned to Afghanistan to reunite with her husband. He lost his father during his infancy, Durranis forefathers were Sadozais but his mother was from the Alakozai tribe. 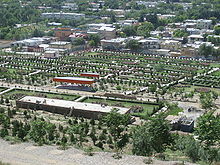 In June 1729, the Abdali forces under Zulfiqar had surrendered to Nader Shah Afshar, they soon began a rebellion and took over Herat as well as Mashad. In July 1730, he defeated Ibrahim Khan, a commander and brother of Nader Shah. This prompted Nader Shah to retake Mashad and intervene in the struggle of Harat. 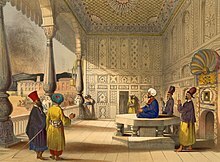 By July 1731, Zulfiqar returned to his capital Farah where he had been serving as the governor since 1726, a year Nadirs brother Ibrahim Khan took control of Farah. 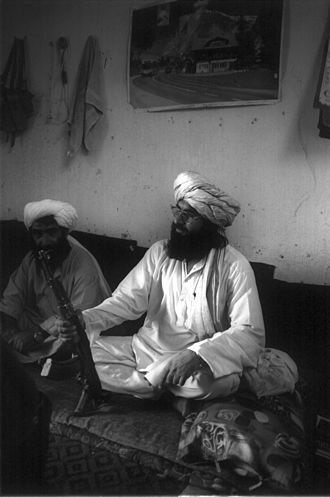 During this time Zulfiqar and the young Durrani fled to Kandahar where they took refuge with the Ghiljis and they were made political prisoners by Hussain Hotak, the Ghilji ruler of the Kandahar region. Inside the tomb, believed to be Babur's, in the garden. Besides flowers and ordinary trees, fruit trees are grown inside the garden, including pomegranate and cherry. An ISAF member stands on top of a hill watching a snow-covered mountain range in Kabul province (March 1, 2013). Afghan President Hamid Karzai at the 2011 Afghan Independence Day in Kabul. Coin of Nasr II, minted in Nishapur (933/4). 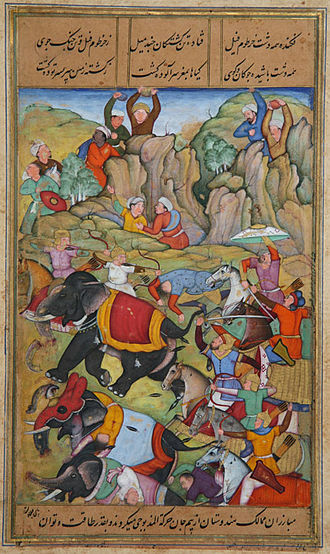 Artwork of Isma'il Muntasir in a battle. 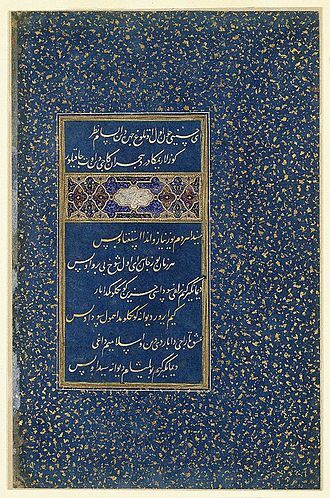 Folio of Poetry From the Divan of Sultan Husayn Mirza, c. 1490. Brooklyn Museum. Illustration from Jāmī's Rose Garden of the Pious, dated 1553. The image blends Persian poetry and Persian miniature into one, as is the norm for many works of the Timurid era. 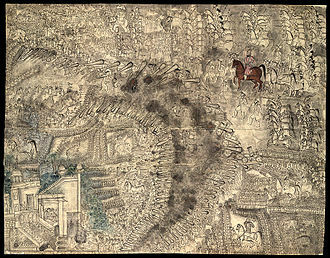 Ahmad Shah Durrani and his coalition decisively defeat the Maratha Confederacy, during the Third Battle of Panipat and restored the Mughal Empire to Shah Alam II. 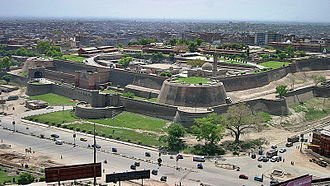 The Bala Hissar fort in Peshawar was one of the royal residences of the Durrani kings. 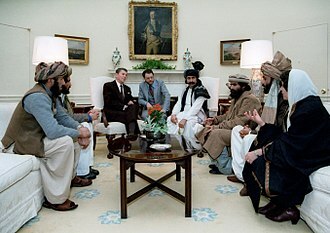 The Taliban emerged in the southern Afghan city of Kandahar around September 1994. 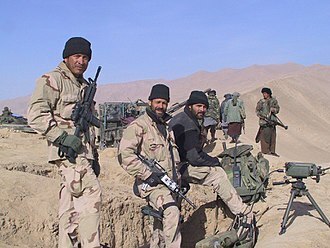 The Taliban were removed from power in October 2001 by a unified effort of United Islamic Front (Northern Alliance) ground forces, small US Special Operations teams and US air support. Ghaznavid era art: Free-blown, wheel-cut carafes. First half of 11th century. 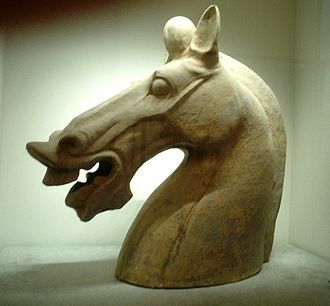 Excavated at Teppe Madraseh, Nishapur, Iran. New York Metropolitan Museum of Art.